The business world is changing, and so is the role of finance. With the arrival of big data, analytics, mobile networking and social media, enterprises big and small are having to adapt in an age of digital disruption. That’s why having effective and flexible financial software solutions has never been more important. 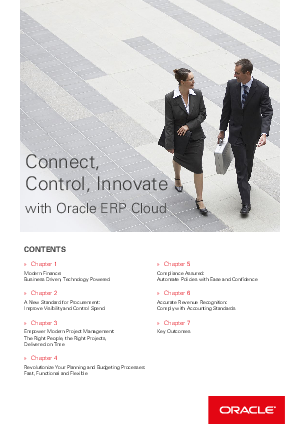 This e-book explores how Oracle ERP Cloud can support your organisation and help you overcome key financial challenges, today and into your future.